As we have clarified in chapter two, the principles. That a Muslim is not pronounced a disbeliever in Allah except if he denies or, rejects something from the religion known by necessity, or makes halaal what Allah made haram, and haram what Allah made halaal. Or that he belittles the Sharī ‘ah, or believes he has a choice in the matter of judging by other than what Allah has revealed. Also that kufr (disbelief) is of two types: Kufr Akbar: which is major disbelief, or kufr in belief, that takes one out of the fold of Islam. And kufr Asgar: which is minor kufr, or kufr in action, that does not take one out of the fold of Islam. And that a Muslim is not pronounced a disbeliever by his sayings, actions or belief until the proof is established against him. And that all the explanations of the verse in Maáidah 44 are understood within the boundaries of all the principles mentioned in chapter two and do not exceed the five sayings discussed in chapter three. So for the noble reader now, we will bring sayings from the salaaf and scholars after them, that affirm the above information regarding the issue of not judging by what Allah has revealed. 1: Ali Ibn Abi Talha narrates from Ibn Abaas in the tafseer of his (Allah) saying “..And whoever does not judge by what Allah reveals then such are the disbelievers “ .That which is the root in this issue he said is “ Whoever denies what Allah reveals then he has disbelieved and whoever accepts it and does not judge by it then he is a dhalim (oppressor), faasiq (sinner). -If he believes that judging by Allahs law is not obligatory or that he can choose or not to choose it or he despises it with awareness that it is the law of Allah then this is major disbelief. -but if he believes that it is an obligation to judge by what Allah has revealed and he understood it in this situation, then did not judge by it with knowledge that he is deserving of punishment ,then he is a sinner. This is called relative disbelief or minor disbelief. That whoever does not judge by Allah law denying it whilst he knows that Allah revealed it just as the Jews done then such a person is a disbeliever (kaafir). 29: Shiekh ul Islaam Ibn Taymiyyah said: “There is no doubt that whoever does not believe in the obligation of judging by what Allah has revealed upon his messenger then he is a disbeliever. So whoever deems it permissible to judge between the people by what he sees to be justful without following what Allah has revealed then he is a Disbeliever. For there is no Ummah except that they have to order to judge with justice whilst the justice in its religion may be what their respected people see to be correct. Furthermore many of those who originate themselves to Islam judge by their customs which Allah did not reveal, like the orders of those tribal leaders in the deserts and those obeyed amongst them and they see that, this is what is desirable to judge by, without the book and the sunnah and this is kufr (disbelief). 30: The learned Imam Ibnul Qayyim al Jowzi (rahimahullaah) said: “That which is correct is -judging by other than what Allah reveals includes two types of kufr (disbelief): Minor and Major dependent upon the condition of the judge (leader). – So whoever turns away from the ruling of punishment for theft or false accusation of fornication, or fornication, not submitting to it because of his dislike of it, and preference of other than it from the legislation of man then he is a clear kaafir (disbeliever). – And whoever does not judge by it due to other faults then he is a dhaalim (oppressor) if in that was the neglecting of rights, or abandonment of justice and equality in it, if not then he is a faasiq (sinner) only. Indeed we see many of the religious Muslims believing, that the civil magistrate courts which judge with the kuffaar laws, as being disbelievers (kuffar) taking the apparent meaning of the verse “And whoever does not judge by what Allah reveals then such are the disbelievers.” and they necessitate by their ronouncing of takfeer on the judge – the one who rules by the laws of the kuffar – the takfeer of the leaders, and those in authority who implement the laws of the kuffar. “So know that the liberating stance in this study is that kufar, dhulm, and fisq (disbelief, oppression, and sin) each one of them is expressed in the shariah to sometimes give a meaning of sin, and sometimes give a meaning of kufr that takes one outside the fold of Islam. – So whoever does not judge by what Allah has revealed in opposition to the messenger and invalidating the rules of Allah then his oppression, sin, and disbelief all of them takes him out of the fold of Islam. 1) One who says that I judge by this because it is better than the Islamic Sharī ‘ah then he is a disbeliever kufar al Akbar . 2) One who says that I judge by this because it is like the Islamic Shari’ah and judging by this is permissible just as judging by the Shariah is permissible. He is a disbeliever kufar al Akbar. 3) One who says that I judge by this and the ruling of the Islamic Shari’ah is better, but the judging by other than what Allah has revealed is allowed. He is a disbeliever kufr al Akbar. 38: This saying has also come from the Muhadith of our time, the faqeh, the Imaam, the mujadid of Islam, the learned Sheikh Naasirud-deen Al-Albaanee, may Allah protect him, make him a source of benefit, and may Allah reward him with the best reward for his efforts with Islam and the Muslims. 39: Then the speech of the two scholars  was read to the Imaam, the Sheikh Ibn Uthaimeen who approved of it and strengthened it. Narrated by Ibn Jareer in his tafseeer 19/357 No.12063 & in Ibn al Mundir &Ibn Abi Hatim. Also see Dur al Manthoor 3/87, and the Saheefa of Ali Ibn Abi Talha from Ibn Abaas 179. Imaam Ahmad said regarding this Saheefa ` in Egypt there is a Saheefa of Tafseer narrated by Ali Ibn Abi Talha, if a man travels to Egypt with an intention to see it, that would be sufficient for him.` Buccari use to rely on this Saheefa extensively for his collection of Authentic Ahadeeth in that which he narrated from Ibn Abaas. The truth is, that it is of the most authentic chains in the tafseer of Ibn Abaas, although Ibn Abi Talha did not hear them directly from Ibn Abaas. They were known by the middle narrators whom Ibn Abi Talha took them from. For indeed he did take them from Mujaahid and Ikrama so there is no defect in that. And Allah knows best. Al Jaami le Ahkaam il Quraan 6/190 and see Ahkaam ul Quraan lil Jassas 2/533. See Mukhtasir Tafseer Al-Khazini 1/310. See Tafseer At Tabari 10/358. (on this point it is imperative that we add the names of those who are of this saying which we found to be many, from them are Al – Barra, Hudaayfa, Dhahaak, Qataada, Aboo Saalih, Aboo Majliz, Abaidullah bin Abdullah bin Utbaa bin Masood, Aboo Ya`la Al-Faraai, so all these said that these verses are specific for the people of the book. These eight names will now be added to the list making so far a total of twenty five sayings of the scholars). Ahkaam ul Quraan of Al-Jassas 2/439. Al-Minhaaj As Sunnah an Nabawia 5/130. Majmoo al Fatawa Shiek ul Islaam 3/267. Tafseer ul Quraan al Adheem 2/61. 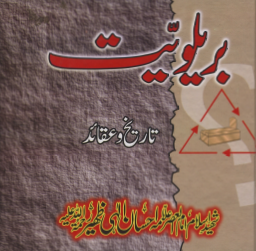 Tayseer ul Kareem ur Rahmaan p-2/296-297. Qadiat tu Takfeer baina Ahli Sunnah wa firq ud dalaala p-72-73. See the cassette ` Fitna tu Takfeer` and others from the recordings of the noble brother Aboo Layla Al Athery. Sheikh Ibn Baaz and Sheikh Al-Albanee. 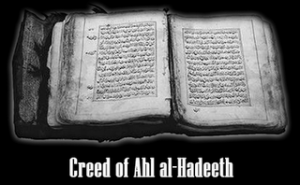 These four books were written by Shaykh al-Islam Imaam Muhammad ibn ‘Abd al-Wahhaab (may Allaah have mercy on him). 5- Al-‘Aqeedah al-Waasitiyyah which deals with Tawheed al-Asmaa’ wa’l-Sifaat (The Oneness of the Divine names and attributes). This is one of the best books written on this topic, and it is worth reading and studying. These two books are more comprehensive than al-Waasitiyyah. These three books were written by Shaykh al-Islam Ibn Taymiyah. 11-Al-Durrah al-Madiyyah fi ‘Aqeedah al-Firqah al-Mardiyyah by Muhammad ibn Ahmad al-Safaareeni al-Hanbali. Therefore the seeker of knowledge has to study it with a shaykh who is well versed in the ‘aqeedah of the salaf, so that he can explain the general statements in it that go against the ‘aqeedah of the righteous salaf. 1- Fath al-Baari Sharh Saheeh al-Bukhaari, by Ibn Hajar al-‘Asqallaani (may Allaah have mercy on him). 4- ‘Umdat al-Ahkaam by al-Maqdisi. This is an abridged book; most of its ahaadeeth are narrated in al-Saheehayn so their authenticity does not need to be researched. This principle – if one made it the path upon which one walks – would be sufficient. Another principle is given concerning when one should speak, “Whoever believes in Allaah and the Last Day, let him say something good or else remain silent.” (Narrated by al-Bukhaari, Kitaab al-Adab; Muslim, Kitaab al-Luqtah, Baab al-Diyaafah). 6- Buloogh al-Maraam, by al-Haafiz Ibn Hajar al-‘Asqallaani. This is a very useful book, especially because it mentions the narrators, and quoted the opinions of others scholars, who said whose hadeeth is saheeh and whose is da’eef, and he comments on the hadeeth to say whether they are saheeh or da’eef. 7- Nukhbat al-Fikr by al-Haafiz Ibn Hajar al-‘Asqallaani. This is considered to be a comprehensive work. If the seeker of knowledge understands it completely then he will have no need of many other books of mustalah (the science of hadeeth). Ibn Hajar (may Allaah have mercy on him) has a useful way of writing, which involves examining every issue in depth and categorizing the topics he discusses. If the seeker of knowledge reads it he will find it stimulating, because it is based on making one think. I say: it is good for the seeker of knowledge to memorize it because it is a useful summary of the science of mustalah (science of hadeeth). 8- The Six Books (Saheeh al-Bukhaari, Muslim, al-Nasaa’i, Abu Dawood, Ibn Maajah and al-Tirmidhi). I advise the seeker of knowledge to read them often, because that will serve two purposes: reviewing the main sources of Islam and reviewing the names of hadeeth narrators. If you often review the names of hadeeth narrators, then whenever you come across the name of one of the narrators of al-Bukhaari in any isnaad, you will know that this is one of the narrators of al-Bukhaari, so you will benefit from this knowledge of hadeeth. 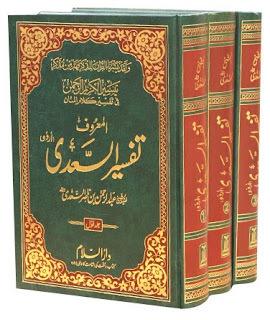 2- Zaad al-Mustaqni’ fi Ikhtisaar al-Muqni’ by al-Hajjaawi. This is one of the best texts of fiqh. It is a blessed book, brief and comprehensive. Our shaykh, ‘Abd al-Rahmaan al-Sa’di (may Allaah have mercy on him) told us to memorize it, even though he had memorized the text of Daleel al-Taalib. 5- al-Usool min ‘Ilm al-Usool. This is an abridged book which serves as an introduction for the seeker of knowledge. 2- Matn al-Burhaaniyyah by Muhammad al-Burhaani. This is a useful and comprehensive abridged book dealing with all the laws of inheritance. I think that al-Burhaaniyyah is more comprehensive than al-Rahbiyyah in some ways, and it gives more information. 1- Tafseer al-Qur’aan al-‘Azeem by Ibn Katheer (may Allaah have mercy on him). This book is good for tafseer based on reports and it is useful and trustworthy. But it does pay much attention to matters of grammar and style. 2- Tayseer al-Kareem al-Rahmaan fi Tafseer Kalaam al-Mannaan by Shaykh ‘Abd al-Rahmaan al-Sa’di (may Allaah have mercy on him). This is a good, easy and trustworthy book, and I recommend it. 3- Muqaddimah Shaykh al-Islam fi’l-Tafseer. This is an important introduction. 4- Adwaa’ al-Bayaan by al-‘Allaamah Muhammad al-Shanqeeti (may Allaah have mercy on him). This is a comprehensive book covering hadeeth, fiqh, tafseer and usool al-fiqh. 1- On (Arabic) grammar: Matn al-Ajroomiyyah. This is an abridged book. 2- Also on Arabic grammar: Alfiyyah Ibn Maalik; this is a summary of the science of grammar. 3- On Seerah (Prophet’s biography): The best book that I have seen is Zaad al-Ma’aad by Ibn al-Qayyim (may Allaah have mercy on him). This is a very useful book in which he mentions the biography of the Prophet (peace and blessings of Allaah be upon him) from all angels, then he discusses many rulings. 4- Rawdat al-‘Uqalaa’ by Ibn Hibbaan al-Busti (may Allaah have mercy on him). This is a useful book despite its brevity. He compiled a large amount of useful material and stories of the scholars, muhadditheen and others. 5- Siyar A’laam al-Nubalaa’ by al-Dhahabi. This book is very useful and the seeker of knowledge should read and refer to it.